Andrade, How Taiwan Became Chinese now on HEB. How Taiwan Became Chinese: Dutch, Spanish, and Han Colonization in the Seventeenth Century. New York: Columbia University Press, 2007. HEB 2010. This new XML title traces the history of Taiwan in this pivotal period of European rule, 1623 to 1662. While also considering a short-lived Spanish colony in northern Taiwan (1626–42), Andrade focuses on the Dutch colony (1624–62) and the emergence therein of a Sino-Dutch hybrid colony, a process he calls “co-colonization.” This process was born out of economic and administrative cooperation between Dutch and Chinese colonists, but it also involved coercion: This is not a book just about peaceful coexistence. These stories of cooperation and competition shed light on one of the most important questions of global history: How do we understand the great colonial movements that have shaped our modern world? Historians have focused on European colonialism, paying little attention to non-western counter examples. 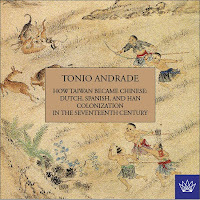 Andrade studies Taiwan because it is a place where European and non-European colonialism met, where two different civilizations encountered “people without history,” and thus an ideal microcosm for understanding colonialism. Much of the documentary evidence for this book comes from the Dutch East India Company (VOC) Collection of the National Archives of the Netherlands in The Hague, as well as from other archives, such as the Arsip Nasional of Indonesia, the Archivo General de Indias, and Chinese sources, many of which can be found online at the Academia Sinica’s Scripta Sinica. This XML title contains 27 maps, many contemporary, accessible in two different hi-res image viewers, and 37 color and b&w figures, many from Caspar Schmalkalden’s Die Wundersamen Reisen… of 1642–52 and from the Academia Sinica’s collection of Genre Paintings of Taiwan Aborigines, modern photos, graphs, and tables. The book also offers a hyperlinked conceptual, topical and thematic index, Unicode Chinese, and hyperlinks to external resources. Please see the complete list of Gutenberg-e titles available and forthcoming in HEB. ACLS Humanities E-Book requests your participation in a survey, which has been designed to test the viability of presenting titles from our collection in new formats for use on handheld e-book readers, including the Amazon Kindle, Sony Reader, and Apple iPhone. Your participation will help us to gather valuable feedback on the use of scholarly titles on handheld devices. To participate, please visit www.humanitiesebook.org/handheld.html. Here you can download one or more free HEB titles to your e-book reader and access the survey. (If you've already downloaded a title, please remember to go back and answer the survey questions!) Titles include: The Arabs and Medieval Europe by Norman Daniel, The Spanish Struggle for Justice in the Conquest of America by Lewis Hanke, and The Great Transformation by Karl Polanyi. To thank you for your time and considered responses, we'll be doing a raffle drawing for three $50 gift certificates to a retailer of your choice: Amazon, Sony, or Apple. Be sure to fill out the contact information on the last screen of the survey to enter the raffle. Individual responses are strictly confidential. The overall results and analysis will be made available in a subsequent white paper.